Human IL-10, His Tag (IL0-H4248) is expressed from human 293 cells (HEK293). It contains AA Ser 19 - Asn 178 (Accession # NP_000563.1). 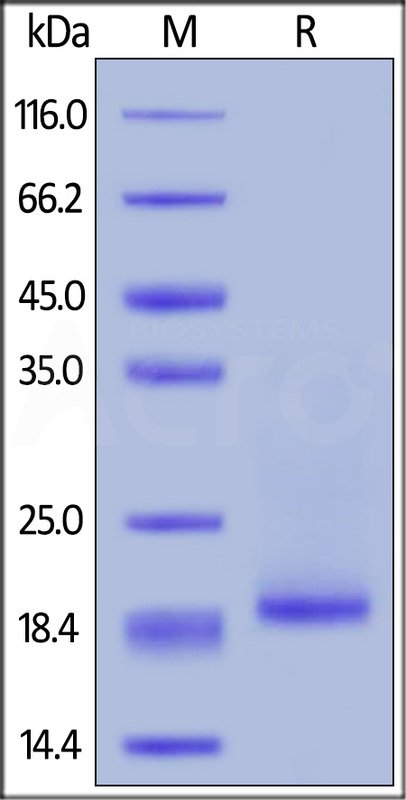 The protein has a calculated MW of 19.5 kDa. The protein migrates as 19 kDa under reducing (R) condition (SDS-PAGE) due to glycosylation. Human IL-10, His Tag on SDS-PAGE under reducing (R) condition. The gel was stained overnight with Coomassie Blue. The purity of the protein is greater than 95%. Interleukin-10 (IL-10) is also known as human cytokine synthesis inhibitory factor (CSIF), is an anti-inflammatory cytokine. IL-10 is an immunosuppressive cytokine produced by a variety of mammalian cell types including macrophages, monocytes, T cells, B cells and keratinocytes. Mature human IL-10 shares 72% - 86% amino acid sequence identity with bovine, canine, equine, feline, mouse, ovine, porcine, and rat IL-10. Whereas human IL-10 is active on mouse cells, mouse IL-10 does not act on human cells. IL-10 is capable of inhibiting synthesis of pro-inflammatory cytokines such as IFN-γ, IL-2, IL-3, TNFα and GM-CSF made by cells such as macrophages and regulatory T-cells. It also displays a potent ability to suppress the antigen-presentation capacity of antigen presenting cells. However, it is also stimulatory towards certain T cells and mast cells and stimulates B cell maturation and antibody production. Knockout studies suggested the function of Interleukin-10 / IL-10 as an essential immunoregulator in the intestinal tract. Patients with Crohn's disease react favorably towards treatment with bacteria producing recombinant interleukin-10, showing the importance of interleukin-10 for counteracting excessive immunity in the human body. (1) Vieira, P. et al., 1991, Proc. Natl. Acad. Sci. 88:1172. (2) Hsu, D.H. et al., 1990, Science 250:830. (3) Sabat, R. et al., 2010, Cytokine Growth Factor Rev. 21:331. (4) Blackburn, S.D. and E.J. Wherry, 2007, Trends Microbiol. 15:143. (5) Fitzgerald DC., et al., 2007, Nat. Immunol, 8:1372.